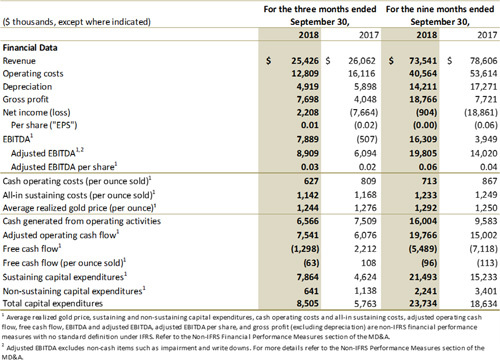 Jaguar Mining Reports Third Quarter 2018 Financial Results and Announces Changes to Board of Directors | Jaguar Mining Inc.
Toronto, November 14, 2018 - Jaguar Mining Inc. ("Jaguar" or the "Company") (TSX: JAG) today announced financial results for the third quarter (“Q3 2018”) and nine months (“9M 2018”) ended September 30, 2018. The Company also announces Richard Falconer has stepped down as Chairman of the Board and Thomas Weng, current Director, has been named Chairman. Mr. Falconer will continue to serve on the Board at least until the Company’s Annual General Meeting in 2019. Net income of $2.2 million, or $0.01 earnings per share, from a Net loss of $7.7 million or net loss per share of ($0.02) year-over-year. Sustaining capital expenditures increased 41% to $21.5 million investing in development and mining equipment. Thomas continued, “Jaguar is positioning itself to return to a more sustainable and growing gold production profile to create value for shareholders. Our operating and management teams have identified key issues and are executing initiatives to improve production while also taking steps to reduce overall expenses. The Board views company-wide expense reduction as a key element to helping Jaguar build a strong foundation and more profitable future." Mr. Weng was appointed as a director of the Corporation on April 1, 2016. Mr. Weng has more than 25 years of experience in the financial services sector with focus on mining, metals and industrials. Mr. Weng is Co-Founding Partner with Alta Capital Partners, a financial advisory provider. Previously, Mr. Weng was Managing Director at Deutsche Bank and Head of Equity Capital Markets for Metals and Mining throughout the Americas and Latin America, across all industry segments. Prior to 2007, Mr. Weng held various senior positions at Pacific Partners, an alternative investment firm, and Morgan Stanley and Bear Stearns. Mr. Weng graduated from Boston University with a Bachelor of Arts in Economics. Company generated approximately $6.6 million in operating cash flow with $7.9 million spent in investing activities representing mainly development expenditures. In addition, $1.3 million was paid in financing activities. The Company will also host an earnings conference call on Wednesday November 14, 2018 at 8:30 a.m. ET. Participants in North America may listen to the call by dialing 1-800-319-4610 at approximately 8:20 a.m. (ET) and ask to join the Jaguar Mining Third Quarter 2018 Results Conference Call. International callers should dial 1-604-638-5340. The call will also be webcast live at www.jaguarmining.com. A replay of the conference call will be available after the call until December 14, 2018, at midnight, and can be accessed by dialing 1-800-319-6413, conference ID 2708#. International callers can access the replay by dialing 1-604-638-9010. The audio webcast will also be archived at www.jaguarmining.com. Scientific and technical information contained in this press release has been reviewed and approved by Jonathan Victor Hill, BSc (Hons) (Economic Geology - UCT), Senior Expert Advisor Geology and Exploration to the Jaguar Mining Management Committee, who is also an employee of Jaguar Mining Inc., and is a “qualified person” as defined by National Instrument 43-101 -Standards of Disclosure for Mineral Projects (“NI 43-101”). The Iron Quadrangle has been an area of mineral exploration dating back to the 16th century. The discovery in 1699-1701 of gold contaminated with iron and platinum-group metals in the southeastern corner of the Iron Quadrangle gave rise to the name of the town Ouro Preto (Black Gold). The Iron Quadrangle contains world-class multi-million-ounce gold deposits such as Morro Velho, Cuiabá, and São Bento. Jaguar holds the second largest gold land position in the Iron Quadrangle with just over 25,000 hectares. Cash operating costs and cash operating cost per ounce are non-IFRS measures. In the gold mining industry, cash operating costs and cash operating costs per ounce are common performance measures but do not have any standardized meaning. Cash operating costs are derived from amounts included in the Consolidated Statements of Comprehensive Income (Loss) and include mine-site operating costs such as mining, processing and administration, as well as royalty expenses, but exclude depreciation, depletion, share-based payment expenses, and reclamation costs. Cash operating costs per ounce are based on ounces produced and are calculated by dividing cash operating costs by commercial gold ounces produced; US$ cash operating costs per ounce produced are derived from the cash operating costs per ounce produced translated using the average Brazilian Central Bank R$/US$ exchange rate. The Company discloses cash operating costs and cash operating costs per ounce, as it believes those measures provide valuable assistance to investors and analysts in evaluating the Company's operational performance and ability to generate cash flow. The most directly comparable measure prepared in accordance with IFRS is total production costs. 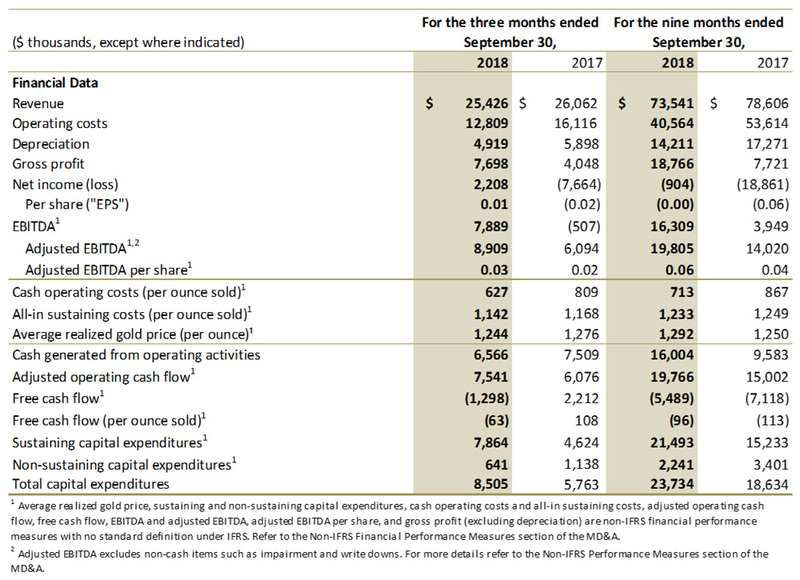 A reconciliation of cash operating costs per ounce to total production costs for the most recent reporting period, the quarter ended September 30, 2018, is set out in the Company's third quarter 2018 Management Discussion and Analysis (MD&A) filed on SEDAR at www.sedar.com. All-in sustaining cost is a non-IFRS measure. This measure is intended to assist readers in evaluating the total costs of producing gold from current operations. While there is no standardized meaning across the industry for this measure, except for non-cash items the Company's definition conforms to the all-in sustaining cost definition as set out by the World Gold Council in its guidance note dated June 27, 2013. The Company defines all-in sustaining cost as the sum of production costs, sustaining capital (capital required to maintain current operations at existing levels), corporate general and administrative expenses, and in-mine exploration expenses. All-in sustaining cost excludes growth capital, reclamation cost accretion related to current operations, interest and other financing costs, and taxes. A reconciliation of all-in sustaining cost to total production costs for the most recent reporting period, the quarter ended September 30, 2018, is set out in the Company's third quarter 2018 MD&A filed on SEDAR at www.sedar.com.